Review: With a unique twist on the Bigfoot theory the new animated adventure SMALLFOOT has a village of Yetis debating the existence of humans. Though not a bar raising endeavor this one does have plenty of laughs, lovable characters, and a powerful message of what it means to question beliefs. Migo (Channing Tatum) is a rule loving Yeti who is ready to follow in his fathers (Danny DeVito) footsteps. The village in which he lives is a happy place where everyone gets along and no one ever questions, well, anything. The laws that govern them have been handed down for generations and carried out by the Stonekeeper (Common). But when Migo stumbles upon a human he begins to wonder if anything he has been told is true. The simple story line is full of thoughtful moments and subtle pokes at societies behaviors. The human (James Corden) Migo finds is a reality adventurer whose show is in a ratings slump. He thinks there’s nothing better than real-life Yeti footage to boost his following. They are both interested in showing their own world they exist. 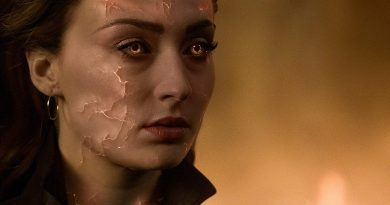 The Stonekeeper is adamant about keeping this human thing under wraps even to the extent of banishing Migo from the village. This part of the story shines a light on what it means to question things we don’t understand and the willingness to risk it all for the truth. Young movie goers will enjoy the animation and the Yetis are a lot of fun. There is plenty of slapstick comedy and hilarious situations. Adults aren’t completely left out and will find enough to stay engaged as well. A couple of scenes reminded me of the classic Looney Tunes cartoons in which one over the top action sequence builds upon another. This was a clever way to fill in the lulls in the story without completely losing the audience. 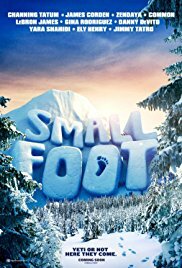 SMALLFOOT is rated PG for some action, rude humor, and thematic elements. Obviously it is safe and fun for the whole family with nothing to worry about. Unless toilet paper humor offends you. Again, this is not the best film of the year but certainly worth a trip to the cineplex with your 5-10 year olds. It will fair even better once it hits Blu-ray and kids can pop it in as background entertainment. I give it 3 out of 5 invisible scrolls. My 6 year old stayed in his seat the whole time which says something for sure.